As vertebral artery dissections may cause stroke, they must be identified and treated promptly. The association of arterial dissection with dental procedures has been previously observed. In this article, we report on a patient presenting with posterior circulation stroke secondary to vertebral artery dissection following a dental procedure. The clinical course, radiologic findings and management are described and the literature regarding vertebral dissections is reviewed. Dissection of a vessel is a process in which a tear leads to blood entering the wall of the artery under pressure and splitting its layers. This results in either acute narrowing of the vessel lumen leading to obstruction or stenosis or dilatation of the vessel wall at the site of weakening leading to formation of an aneurysm. If the tear is subintimal, the dissection leads to luminal narrowing and occlusion. Vertebral artery dissection (VAD) resulting from trauma is an important cause of stroke in otherwise healthy people with no known stroke risk factors. The average annual incidence of VAD is 1.0–1.1 per 100 000.1 Dental procedures that involve prolonged neck posturing may cause VAD. Diagnosis is based on clinical and radiologic findings. In this article, we describe a patient presenting with VAD and posterior circulation stroke following a dental procedure. A 63-year-old, previously healthy man underwent a dental filling procedure during which his neck remained in an extended and rotated position for about 1.5 hours. Although the procedure was uneventful, that night he experienced the acute onset of diffuse, severe throbbing headache and pain on the left side of his neck associated with several bouts of vomiting. The symptoms were aggravated with neck turning to either side. About 5 hours later, the patient noted imbalance and incoordination while walking. The following morning, he attended the emergency department, where neurologic examination revealed a conscious, alert patient with gait ataxia and no other neurologic deficits. General physical examination and systemic examination were normal. A computed tomography (CT) scan of the brain did not reveal any abnormality. 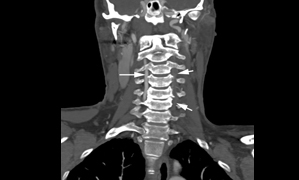 However, CT angiography of the head and neck showed a long-segment thrombus in the vertebral artery reaching from its origin to the mid-V4 segment (Fig. 1a). The thrombus also extended into the proximal subclavian artery. The patient had no risk factors for an atherosclerotic vascular disease, e.g., hypertension, diabetes mellitus, coronary artery disease, dyslipidemia or smoking. There was no family history of dissections. In view of his neck pain, headache and the temporal relation of symptoms to the prolonged neck posturing during the dental procedure, a diagnosis of VAD leading to a posterior circulation ischemic stroke was made. His blood parameters—hemogram, lipid panel, thrombophilia profile, homocysteine and other biochemistry—were normal and electrocardiogram and echocardiogram were unremarkable. The patient was started on continuous intravenous heparin using a standard protocol of the stroke unit. The following day, he developed increased headache, vomiting and left-side numbness and incoordination. Examination revealed normal cranial nerves, inability to perform left finger-to-nose and heel-to-shin tests, a reduction in sense of touch and joint position on the left side and reduced appreciation of pinprick on the right side. Magnetic resonance imaging of the brain revealed a left posterior inferior cerebellar artery territory infarction, appearing bright on a diffusion-weighted image (Fig. 1b). Magnetic resonance angiography (MRA) revealed an occluded left vertebral artery (Fig. 1c). Figure 1a: Angiography of the neck vessels (coronal section) using computed tomography showed a normal right vertebral artery (long arrow) and a markedly attenuated signal in the left vertebral artery with a long-segment thrombus (short arrows). Figure 1b: Magnetic resonance imaging of the brain showed an infarct in the cerebellum, appearing as a bright signal on the diffusion-weighted image (arrow). Figure 1c: Magnetic resonance angiography revealed a normal signal for the right vertebral artery (horizontal arrow) and the absence of signal for the left vertebral artery with evidence of some flow distally (angled arrows). Acetylsalicylic acid (ASA; 81 mg/day) and clopidogrel (75 mg/day) were added to heparin; this combination was later replaced with warfarin. The patient made a steady recovery over the ensuing week and was later transferred to the rehabilitation unit with mild left cerebellar signs and sensory deficits. Cases of vertebrobasilar arterial ischemia secondary to a dental procedure have been described in the past.2,3 Several mechanisms of ischemia during neck manipulation have been postulated. Rotation of the neck to either side in addition to flexion or extension can cause hemodynamic changes leading to a 2- to 3-fold reduction in the blood supply. Arterial spasm and dissection are the other important mechanisms. The vertebral artery is extremely vulnerable to torsion injury because it winds round the atlas to enter the skull. Any abrupt rotation of the neck may stretch the artery and tear the delicate intima.4 Anatomically, the vertebral artery is divided into 4 parts: V1, from the origin to its entry into the transverse foramina of the cervical vertebrae; V2, which traverses the cervical vertebrae; V3, which comes out of the cervical foramina to pierce the dura before entering the skull; and V4, the intracranial portion.Dissections occur most commonly in the V2–V3 area. Headache and neck pain are important warning symptoms of dissection. Headache is reported in up to two-thirds of cases and neck pain in half.3 Hyperextension of the neck is considered to be an important predisposing factor for vertebral artery dissections. Even mild mechanical stress within the preceding 24 hours may be a trigger for cervical artery dissection.5 The role of repeated minor trauma has also been implicated. Our patient had had 2 sessions in the dental office in the preceding 3 weeks, each lasting for 60 minutes. Symptomatic dissections are generally treated with anticoagulants using heparin in the acute phase and oral anticoagulants for about the next 3 months to prevent thromboembolic complications. A repeat MRA may be performed at 3 months to assess the degree of healing of the vessel and establishment of blood flow. If the vessel continues to be thrombosed, the patient may change to ASA at this stage or continue with oral anticoagulants for another 3 months followed by oral ASA thereafter. The prognosis for dissections is generally good, although factors such as the degree of ischemia and collateral dynamics play an important role.6 Endovascular interventions, such as stenting, are considered if the patient fails to respond well to conservative management and continues to be symptomatic. Seemingly trivial trauma, such as prolonged extension of the neck during dental procedures, may cause arterial dissections and ischemic strokes. A high degree of suspicion is necessary to ensure prompt diagnosis, especially in the setting of headache, neck pain and recurrent vomiting. A delay in diagnosis or in the institution of appropriate therapy in symptomatic patients could cause extensive ischemia due to embolism from the thrombus in the vessel wall or extension of the thrombus distally with a resultant potential catastrophe. With therapy, the prognosis for this condition is generally good. Dr. Shobha is a clinical fellow in the department of clinical neurosciences, Calgary Stroke Program, University of Calgary, Calgary, Alberta. Dr. Bhatia is an associate professor in the department of neurology, Neurosciences Centre, All India Institute of Medical Sciences, New Delhi, India. At the time this article was written, Dr. Bhatia was a clinical fellow in the Calgary Stroke Program. Dr. Barber is an assistant professor in the department of clinical neurosciences, Calgary Stroke Program, University of Calgary, Calgary, Alberta. Correspondence to: Dr. Rohit Bhatia, Department of neurology, Neurosciences Centre, All India Institute of Medical Sciences, New Delhi -110029, India. Kim YK, Schulman S. Cervical artery dissection: pathology, epidemiology and management. Thromb Res. 2009;123(6):810-21. Machado DM, Gomez RS, Gomez RS. Vertebrobasilar ischemia after a dental procedure. J Oral Maxillofac Surg. 1999;57(12):1463-5. Prabhakar S, Bhatia R, Khandelwal N, Lal V, Das CP. Vertebral artery dissection due to indirect neck trauma: an underrecognised entity. Neurol India. 2001;49(4):384-90. Norris JW, Beletsky V, Nadareishvili ZG. Sudden neck movement and cervical artery dissection. The Canadian stroke consortium. CMAJ. 2000;163(1):38-40. Dittrich R, Rohsbach D, Heidbreder A, Heuschmann P, Nassenstein I, Bachmann R, et al. Mild mechanical traumas are possible risk factors for cervical artery dissection. Cerebrovasc Dis. 2007;23(4):275-81.